Heficed Review 2019: Is Heficed a Good Hosting? Heficed was founded in 2008 (as Host1Plus) with a business model to provide high-value hosting services to enterprise-scale clients. It specializes in providing high-value VPS, cloud, and dedicated server hosting. Heficed was founded in 2008 under the brand name Host1Plus. Its vision is to be the leading platform for network engineering and IP address management, and it currently serves more than 100,000 customers around the world. Heficied’s website is in English. Kronos Cloud is Heficed’s enterprise cloud package that allows you to add up to 2048 IP addresses (blacklist free) to your virtual machine via the automatic Switch platform. The advantage of Kronos Cloud is that it is built on top of the KVM hypervisor open source virtualization technology that allows a host machine to run multiple, isolated virtual environments. The services are scalable and can be managed via the Heficed Terminal or an API. You can also easily customize your Kronos Cloud as though it is a dedicated server. For example, you can choose your operating system, remote control, and configurations. If you do need a dedicated server, Heficed offers the 100% isolated Proto Compute environment that provides custom server architecture, global locations worldwide, and up to 4096 IP addresses attached via the automated Switch platform. As you might expect, whether it’s VPS, cloud, or dedicated server hosting, Heficed’s packages are priced at the higher end of the spectrum. There is no free plan available, but a 14-day money-back guarantee is available upon request (excluding dedicated servers). Support is where Heficed shines. There is a decent knowledge base so you can easily search for solutions on your own. If self-support isn’t sufficient, the support team is available 24/7 via email, tickets, or live chat. I contacted the team via live chat on a weekday morning. 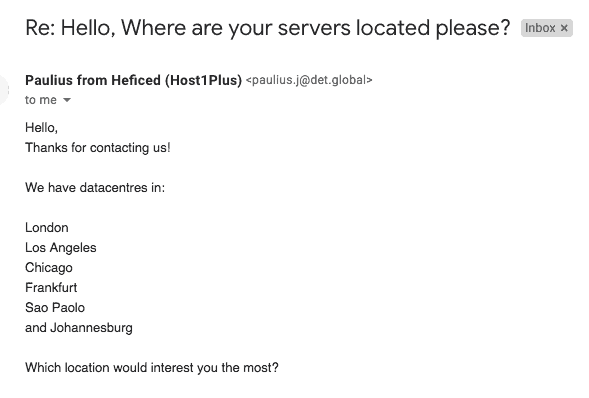 Although the live chat window appeared to be offline, I still received a helpful reply within an hour, which was good enough for me despite not being within the advertised 30-minute response time. Since Heficed specializes in services for enterprise-scale clients, you won’t find the typical shared or reseller hosting packages in its portfolio. However, Heficed is an attractive choice if you’re in the market for extremely stable and scalable VPS, cloud hosting, or dedicated server plans for your demanding business requirements. Buy enterprise-level hosting now at Heficed! Wondering how Heficed stacks up against other Web Hosting companies? Enter any other Web Hosting company and we will give you a side-by-side comparison.